Yesterday, I took a vacation day to run some holiday errands and sneak in some time in my kayak. At first we had planned to hit the North Canadian River near Pierce, Oklahoma, but the wind and current were a bit forbidding and there wasn't any sunshine. 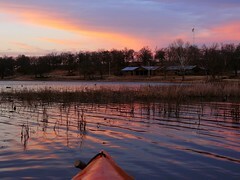 Since one of my errands took us to nearby Henryetta, Oklahoma, we decided to paddle at Nichols Park. Nichols Park, a National Historic Site, encompasses more than 300 acres and features a low traffic 10-acre reservoir lake. The lake has rather high banks on the North side and thick forest line on the south side that makes for some nicely wind-sheltered paddling. Fishing is free at Nichols Park. Manually-powered water crafts are allowed on the lake, however all other vessels are strictly prohibited. Nichols Park also offers the Living Legends Rodeo Arena and the Henryetta Little League Complex. On Labor Day every year, over 1,500 spectators gather at Nichols Park to watch The Living Legends Rodeo. The park is located about a mile and a half south of Main Street on Lake Road in Henryetta. Sounds like an excellent Bass pond. I live close to there and never even knew about it.